The Sunstar GUM Denture Brush is recommended by dental professionals for the daily care of removable dentures and acrylic retainers. The Denture brush consists of two differently configured brush heads: a flat bristled head for smooth surfaces and a single-tufted head for hard-to-reach areas. The strong flat bristles are extremely resilient and efficiently remove dental plaque, food particles and other debris from the inner and outer surfaces. 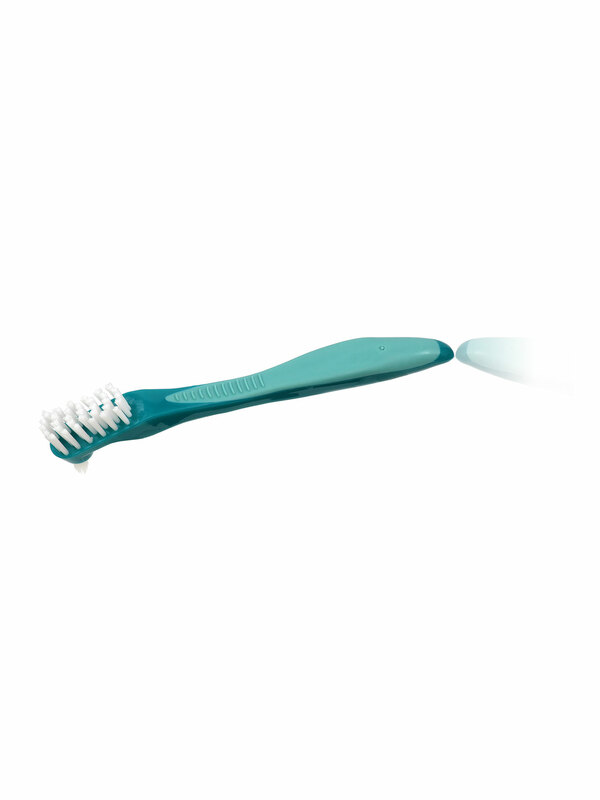 The single-tufted head consists of tapered bristles, which provide superior cleaning in the hard-to-reach areas regular toothbrushes cannot reach. 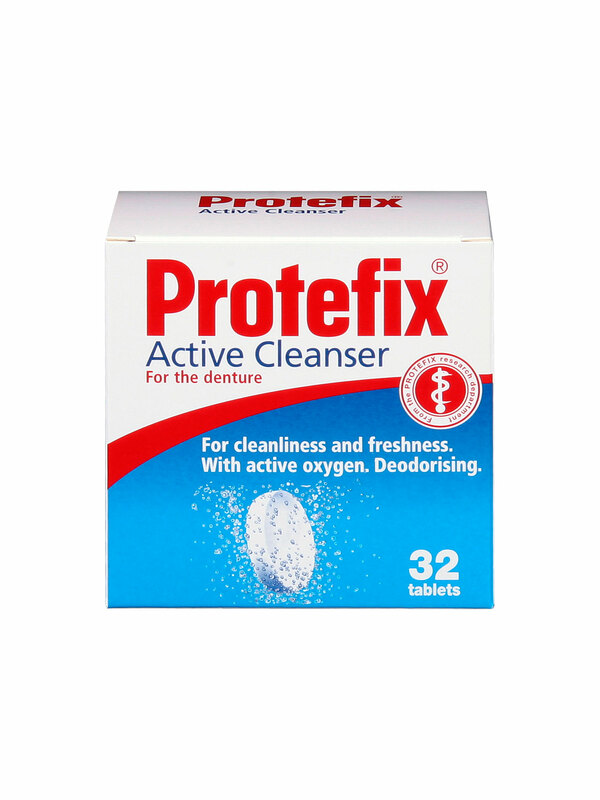 Protefix Active Cleanser tablets cleanses and deodorise dentures in as little as 15 minutes for all-day freshness and cleanliness. Using active oxygen Protefix Active Cleanser is powerful enough to cleanse thoroughly without damaging the dentures. Non aggressive to denture-material, applicable also to material-mix dentures. Suitable for children's temporary dentures. Each box contains 32 individually sealed tablets. Especially suitable for temporary dentures during bridging period. Protefix provides products that deliver comprehensive solutions for problems experienced by denture-wearers. 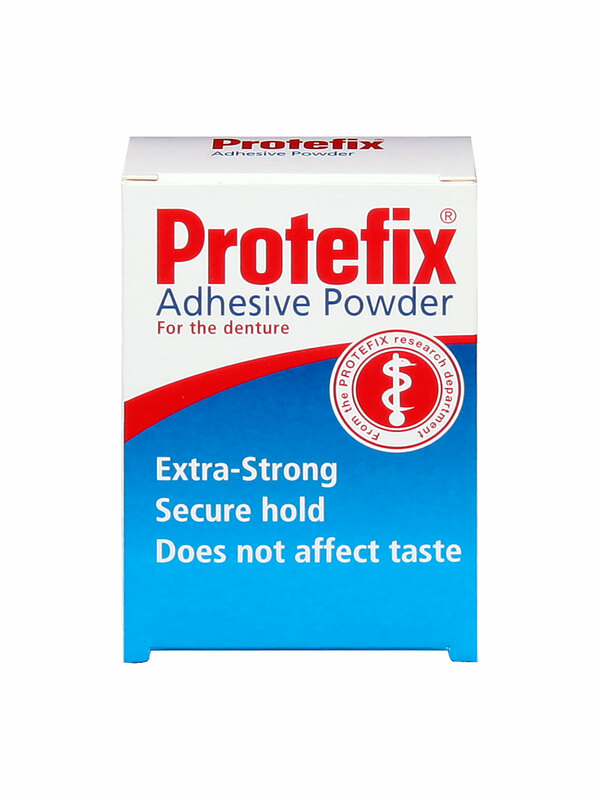 The Protefix range is recommended by dental specialists for all denture problems from cleansing to adhesion. Made in Germany and sold in 50 countries worldwide. This fine, woven fleece, well tolerated by the palate, is used mainly during the bridging period, while wearing a temporary denture. It contains sodium alginate which increases the fixative power shortly after being moistened. 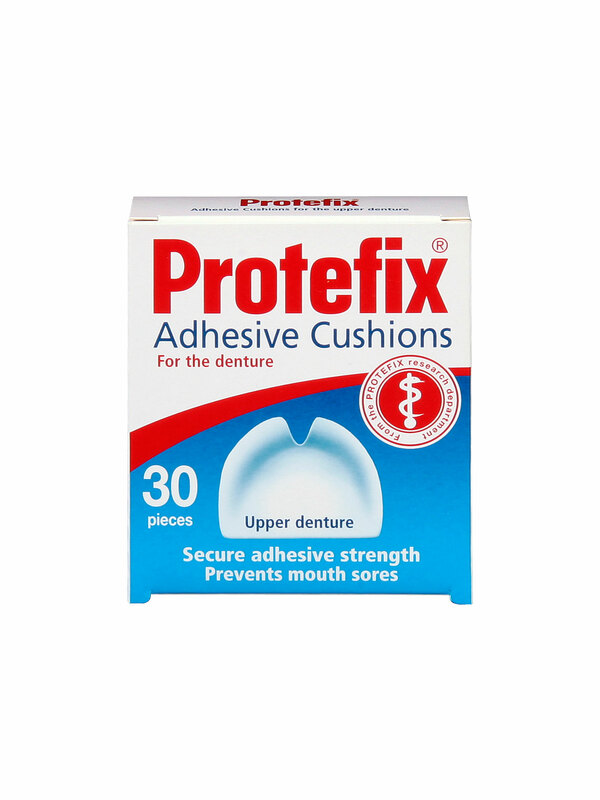 For some denture wearers with large adhesion problems - if nothing else will hold - Protefix Adhesive Cushions are the Perfect solution. Protefix provides products that deliver comprehensive solutions for problems experienced by denture-wearers. The Protefix range is recommended by dental specialists for all denture problems from cleansing to adhesion. Made in Germany and sold in 50 countries worldwide, Protefix Adhesive Cream is the ideal solution for a wide range of adhesion problems. Protefix Adhesive Cream is recommended for both difficult adhesion conditions and increased saliva flow. It is a 100% natural product with NO preservatives and made from sea-algae (sodium alginate). It is easy to apply, tasteless and does not lead to any unpleasant changes in the flavour of food and drinks. Protefix provides products that deliver comprehensive solutions for problems experienced by denture-wearers. The Protefix range is recommended by dental specialists for all denture problems from cleansing to adhesion. Made in Germany and sold in 50 countries worldwide. Protefix Adhesive Cream is the ideal solution for a wide range of adhesion problems. 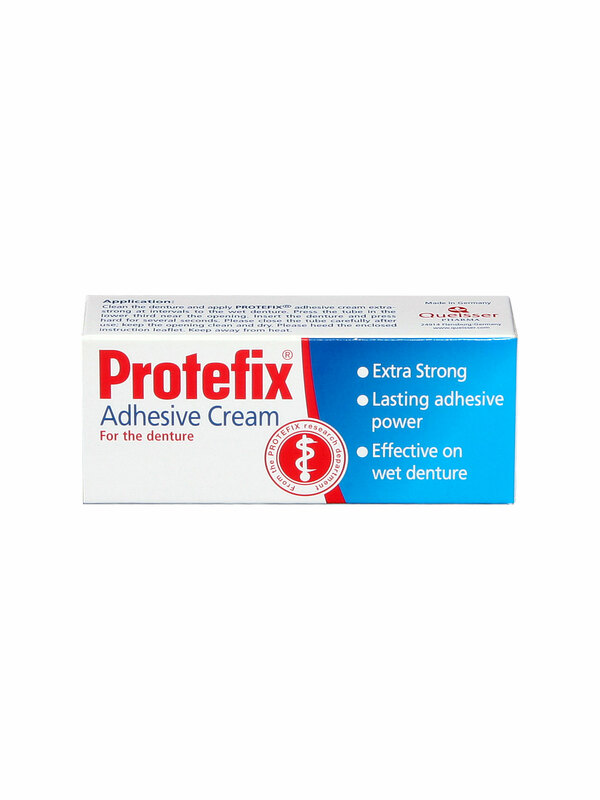 Protefix Adhesive Cream is recommended for both difficult adhesion conditions and increased saliva flow. It is easy to apply, tasteless and does not lead to any unpleasant changes in the flavour of food and drinks.